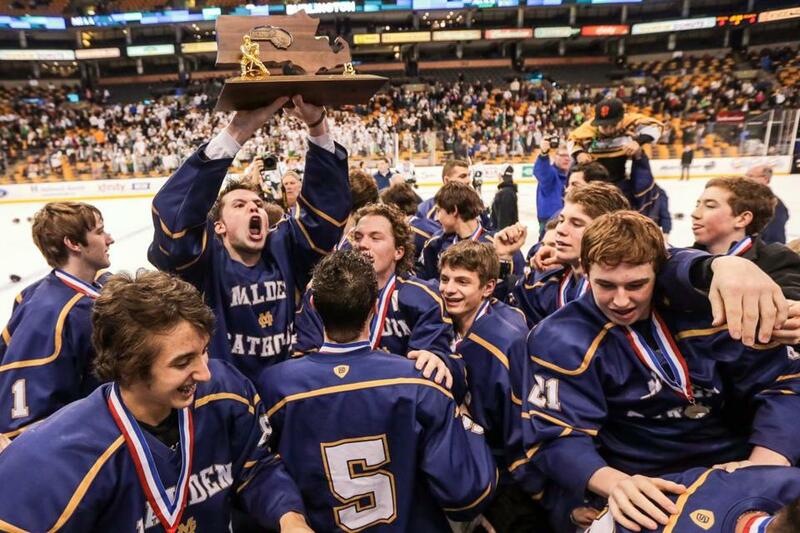 Malden Catholic, helped by All-Scholastic Ara Nazarian, won the Super 8 title this season. The Catholic Conference co-MVP has started 74 consecutive games since freshman year. This year, the senior had a .946 save percentage and seven shutouts. 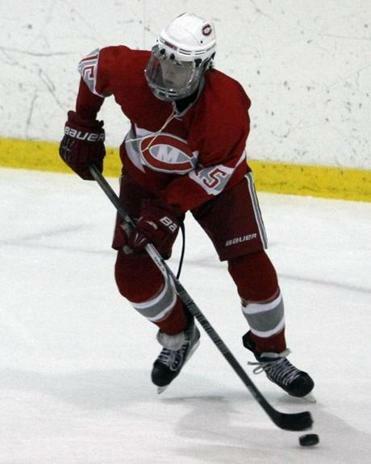 Cronin plans to play in college in Division 3 or juniors in the EJHL next year. Foley scored 27 points for the Panthers in his senior season and was named to the Cathedral Classic All-Tournament and the Shriner’s Senior All-Star teams. The senior plans to attend Phillips Exeter, Berkshire, or Choate for a post-grad year. Nazarian put together two incredible seasons for the Lancers. Last year, he scored 15 goals in the regular season and five in the Super 8. This year’s tally was 26 goals and eight in the postseason, including four shorthanded goals. In his second season as captain, Pinho helped the Eagles finish as Catholic Conference champions. The senior scored 17 goals and added 35 assists this season. He has committed to play hockey at Providence College. A two-time Catholic Central All-Star, the Cougars senior led his team in goals and assists with 22 and 18, respectively. Vesey, who was this year’s Catholic Central MVP, and the Cougars fell to Malden Catholic in the Super 8 final. Owens tallied 21 goals and 25 assists in his senior year, leading the Wildcats to the Division 2 state championship for the second straight year. He finished his career at Wilmington with 72 goals and 86 assists and plans to attend UMass Lowell. Bishop finished his senior year with 45 points for the Lions and was awarded MVP honors for the Merrimack Valley/Dual County League. He will attend Phillips Andover next year and hopes to play for a Division 1 hockey school. The Clippers’ goalie recorded a save percentage of .937 in 25 games, including four shutouts, this season. Buckley also played football and lacrosse at Newburyport. He will attend Fitchburg State in the fall. One reason for Catholic Memorial’s return to the Super 8 was the play of senior captain Liam Coughlin, who finished the season with 28 goals. The senior captain led the Knights with a 50-point season, including 28 goals and 22 assists. Coughlin plans to play one year of juniors and then hopes to play in college for a Hockey East team. D’Antuono followed up his sophomore year, when he was named Hingham’s most outstanding offensive player, with a 50-point performance, tallying 31 goals and 19 assists this season for the Harbormen. The junior right wing has a career toal 44 goals and 40 assists. Davis was named the Bay State MVP and a league All-Star after recording five shutouts and a 1.53 goals against average this year. He has 15 career shutouts. Davis, who also plays baseball for Norwood, will attend Worcester Academy next year. The Rockets’ senior captain helped lead his team to the Middlesex League title this season and finished with 56 career points. Devaney was also the captain of Reading’s tennis and golf teams this year. He will attend Phillips Andover Academy next fall. Dragun finished his senior season with 22 goals and 20 assists and was named the Hockomock MVP. He capped off his career at Attleboro with 100 points. Dragun will attend New England College next year. Irving scored 43 points for the Panthers, who won the Northeastern Conference and captured the No. 1 seed in the playoffs. The senior scored a total of 125 points in his four seasons and was selected to play for the Vally JR Warriors. Najjar was a true sniper and playmaker for Belmont Hill this year, tallying 20 goals and adding 25 assists as the team’s senior captain. He finished his career with 102 points and a pair of All-ISL honors. An honor student, he will attend Middlebury. One of the top blue liners in New England, Nylen earned ISL Eberhart MVP honors this year, tallying three goals and 24 assists in helping win the ISL and NEPSAC Piatelli-Simmons titles. A three time all-star, he will attend Sacred Heart. The Merrimack Valley/Dual County League Division 2 MVP notched 21 goals and 27 assists in his senior season to bring his career points total to 130. Petti plans to attend Northwood or play juniors next year. Turcotte scored 27 goals and notched 30 assists to earn Tri-Valley League MVP honors for the second time. He finished with 132 points in four seasons (66 goals, 66 assists), and will attend prep school or the University of New Hampshire next year. In his 10th season, Coach Finocchiaro brought his team to its sixth Super 8 tournament appearance this season, reaching the finals for the first time. Finocchiaro credits his coaching staff and remarkable players for this year’s success. The Lions, who did not receive a tournament bid in 2009 or 2010, have seen continued improvement under Coach McGrath. Chelmsford finished 9-9-2 in 2011, 12-6-2 last year, and earned the top seed in the 2013 Division 1 North tournament with a 14-3-4 record. Coach Spillane led the Panthers to a 17-8-2 record this season, winning the Division 2 South title. They finished runner-up to Wilmington in the Division 2 title game. Spillane is a Franklin High and UMass-Boston alum and has coached hockey for 15 years. Coach Faia and Big Blue finished the regular season at 19-6 and captured the Division 3 North and Eastern Massachusetts titles. Faia believes this record season for Swampscott was due to a team that was united, disciplined, and never quit. Atlantic Coast — Dennis-Yarmouth: Kevin LaCroix, Adam McClay, Casey Saunders. Falmouth: Durham Ghelfi, Nick Lineaweaver, Cyrus Wickersham. Marshfield: Matt Burchill, Mike Carbone, Kevin McDougall, Pat Shea, Jon Spitz. Nauset: Adam Huber, Connor Martin. Plymouth North: Tommy Duddy, Brandon Ferrell. Plymouth South: Timmy Elrick. Sandwich: Drew Buckland, John Casista, Nick Kennedy. Bay State — Braintree: Pat Horrocks, Tom Mahoney, Troy Tenaglia, Nick Ward. Brookline: Jake Paul. Framingham: Kyle Caso, Al Lynch. Milton: Brendan Kelley. Natick: Matt Kustra, Andrew Watkins. Newton North: Anthony Calabro. Norwood: Jordan Davis, Jack Sheehan, Dan Wiseman. Walpole: John White. Weymouth: Pat Coleman. Big Three — Brockton: Mike Heffernan, Ryan MacIntosh, Jordan MacIntyre, Franco Massaro, Korey Paull, Ian Peterson, Alex Radcliffe, Colin Weathers. Durfee: Tyler Amaral, John Bonanca. New Bedford: Justin Ferreira, Quinn Indio. Boston City — East Boston: Anthony Bruno, Shaun O’Halloran, Joseph Tassinari. Latin Academy: Shane Finn, Paul O’Keefe, Patrick Owens. O’Bryant: Sean Haugh, Christian Polanco. Cape Ann — Amesbury: Anthony Licciardello, Tabor Smith. Masconomet: Alex DiGiorgio. Newburyport: Alex Buckley, Jayson Dylingowski, Connor Wile. North Reading: Keith Linnane. Pentucket: Ian Mitchell, Tom Pingree. Triton: Derek Donley, Tucker Johnson. Catholic Central — Archbishop Williams: Ryan Dunn, Mike Jessman, Nick Menzel, Jake Reardon, Michael Sorenti, Joseph Vinay. Arlington Catholic: Zach Blanche, Billy Cooke, Jon Luke Dee, Brendon O’Connell. Austin Prep: Frank Candelino, Bob Carpenter, Andrew Cross, Cam Russo, Nolan Vesey. Bishop Fenwick: Drew Thibodeau. Lowell Catholic: Jake Barnacle, Adam Beckuith, Rick Cincotta, Aaron Crandall, Will O’Neil, Griffin Rega, Shane Silvia. Marian: Zaven Bablouzian, Zack Moore, Nick Sebastiano, Brendan Walsh, John Walsh, Nick White. Matignon: R.J. Guardia, Shane Mason. St. Joseph’s Prep: Matt Dighton, Taras Kornelyuk, Joe McKinnon, Alex Watson. St. Mary’s: Cam Grenham, Nick Holt, Ryan Madden. Catholic Conference — BC High: Tom Besinger, Mike Brooks, Peter Cronin, Patrick Kraemer, Chris LaLiberte, Ryan McDonough, Sam Topham. Catholic Memorial: Brendan Collett, Liam Coughlin, Sean Heelan, Dennis Medieros, Jack O’Hear. Malden Catholic: Casey Fitzgerald, Mike Iovanna, Ara Nazarian, Nick Rolli, Tyler Sifferlen. St. John’s Prep: Tyler Bird, Andrew Brandano, Justin Longo, Jack McCarthy, Brent Murray, Brian Pinho, Billy Price. Xaverian: Connor Biogiotti, Mike Brennan, Antonio Marini, Matt Michaels, Eddie Pratt. Catholic West — Cathedral (Springfield): Matt Foley. Commonwealth — Minuteman: Eric Brogna, Lucas Taylor. Nashoba Valley Tech: Matthew Brennan, Carl Marzolini, Brad Medlin. Northeast: Anthony Aresco, Kenny Bartolo, Jonah Hadley, Mike Wesley. Rockport: Alex Amoroso, Joe Ferrante, Colby Foster, Josh Guertin, Kyle Nelson, Mike Tupper. Shawsheen: Ryan Capraro, Matt Curran, Lucas Daniels, Nolan Gaffey, Corey Poirier. Eastern Athletic — Bishop Feehan: Maxwell Johnson, Connor Martin, Christopher McGrath, Kelly Schofield. Bishop Stang: David Skarbeck. Coyle & Cassidy: Frank Cambria, Nick Cambria, Greg DiBona, Ryan Jones. Martha’s Vineyard: Tyson Araujo, Charlie Ashmun, Brian Fraser. Somerset Berkley: Zach Raposa. Greater Boston — Cambridge: Dominic Freddura. Everett: Shawn Doyle, Vinny Sottosanti. Medford: AJ Ansaldi, Jake Porazzo. Somerville: CJ Albanese, Troy Martini. Hockomock — Attleboro: Zack Dragun. Canton: Brian Brooks, Kurt Leavitt, Pat Ward. Foxborough: Scott McDonald, Kyle Sprezel. Franklin: Cameron Curley, Aiden Isberg, Kyle Powers. King Philip: Nick D’Amico, Jack Riley. Mansfield: Brendan Murphy, Rich Shipman. Milford: Jared Balzarini, Brad White. North Attleborough: Ryan Burns, Sean Young. Oliver Ames: Justin Davidner, Andrew Mancini, Andrew Romans. Stoughton: Paul Sheehan. Taunton: Connor Ladino. ISL — Belmont Hill: Will Golonka, Carl Hesler, Ryan McConnell, Mike Najjar. Brooks: Greg Conrad, Mitch Nylen, Ian Speliotis. BB&N: Jordy Abrams, Connor Hegarty, Bobby Mullins. Governor’s Academy: Lucas Bombardier, Nathan Ferriero, Brendan McMenimen, Geoff Sullivan. Groton: Dan Glavin, Matt Pompa. Lawrence Academy: George Hunkele, Tommy Newton. Middlesex: Justin Ferreira, A.J. Lucchesse, Billy Olsen. Milton Academy: Chad Malinowski, Cole Morrissette, Anthony Sabitsky, Elliot Vorel, Conner Wynne. Nobles: J.C. Brassard, Tyler Wood. Rivers: Ryan Colena, Miles Gendron, Steve Vansicien, Patrick Young. Roxbury Latin: Matt Deveney. St. George’s: Tim Doherty. St. Mark’s: Alex Hreib. St. Paul’s: Brendan Boyce, Charles-Alexandre Plaisir, Connor Sodergren. St. Sebastian’s: Noah Hanifin, Tommy Kelley, Corey Ronan. Thayer: Jon Barry, Neil Conway, Lincoln Griffin, Robert McGovern. Mayflower — Blue Hills: Evan Cabezas, Austin Carrel, Josh Edwards, Nick Edwards. Diman: Jake Pickering, Jason Silva. Nantucket: Christian Lombardi, Dylan Perry. South Shore Voc-Tech: Derek Carr. Southeastern: Matt Niklason, Billy Sullivan. Tri-County: C.J. Golash. Merrimack Valley/Dual County — Andover: Colby Gilbert. Bedford: Sean Isner, Anthony Lespasio. Billerica: Mike Erickson, Russell Tedford. Boston Latin: Brian Forgione. Central Catholic: Nick Gorski, Lloyd Hayes, Colin Soucy, Corey Webber. Chelmsford: Tom Bishop, Jon Fairbanks. Concord-Carlisle: Brendan Harrington. Lincoln-Sudbury: Jordan Dow, Matt Hall, Erik Kessler. Lowell: Mike Doucette, Matt Mandevile, Brent Sullivan. Methuen: Matt Bauchman, TJ Gannon. Newton South: Peter Block. North Andover: Jake Silk. Tewksbury: Mike Casey, Derek Petti. Waltham: Nick Russo. Wayland: Nick Morgan, Peter Orlandella. Westford: Jay Drapeau. Weston: Matt Cowgill. Middlesex — Arlington: Luke Tremblay. Burlington: Joe Berardi, Derek DeCastro, CJ Grinnell. Melrose: Conor Tryder. Reading: Rob Devaney, Connor Frazier, Mike Thomson. Wakefield: Alec Brown. Wilmington: Drew Foley, Brendan McDonough, Cam Owens, Brian Pickett. Winchester: Brendan Greene, Nolan Redler, Connor Tedesco. Northeastern — Beverly: Nick Albano, Tim Birarelli, Graham Doherty, Matt Hamor, Andrew Irving, Connor Irving, Sean Munzing. Danvers: Rob Buchanon, AJ Couto, Mike Discuillo, Adam Merry, Joe Strangie, Alex Taylor. Gloucester: Peter Mondello, Mike Muniz, Casey Noyes, Alex Webb. Lynn Classical: Kyle Devin, Brett Erelli Lynn English: , Ryan MacDonald. Marblehead: Tyler Bates, Zac Cuzner, Trip Franzese, Liam Gillis, Tom Koopman, Ian Maag. Peabody: Derek DeMild, Chris Minter, Joe Powers, Mike Vadala. Revere: Brendon Mastropietro, John Papasodora. Salem: Spencer Berholtz, Brett Herring. Saugus: Anthony Cieri, Anthony Lopresti. Swampscott: Chris Carman, Corey Carmody, Noah Maercklein, Trevor Massey, Nunzio Morretti. Winthrop: David Capone, Ray Feeley, Stephen Goddard, Pierce Lamberton, Chris Page. Old Colony — Barnstable: Patrick Bess, Chris Fowler, Jason Frieh, Connor Fries, Drew Kaski, Eric Rogorzenski, Max Willman. Bridgewater-Raynham: Truman Daniels, Peter Drowne, Nick Holmes, Brian McSherry, Connor Sullivan. Dartmouth: Joey Correia, Joey Gomes, Evan McCarthy, Brendan Sullivan. Patriot — Duxbury: Chris Johnson, James Marcello, Nick Marracco, Luke Stevens. Hanover: Elijah Marceillo. North Quincy: Nolan Greene, Rudy Tryon. Pembroke: Bobby McEllijott, Ryan Shea. Quincy: Pat Freeman, Jake Hallisey. Scituate: Josh Beck. Silver Lake: Matt Koch, Ryne McNeilly. Whitman-Hanson: Chris Boussy, Nick Pike. South Shore — Abington: TJ Antonetti, Eddie Cardinal, Nate Littman, Mike Walsh. Sacred Heart: Adam Pagliuca, Mark Simonetti. Cohasset: Adam Benson, Terence Doonan, Chris Lund. East Bridgewater: Cam Troup. Hull: Jake Mahoney. Mashpee: Donnie Thompson. Norwell: James Daly, Alex Ferguson, Matt Smith, David Talanian. Rockland: Tim Daggett, Shawn Kane, Andy Reardon, Colin Sheehan, Chris Tanner, Trevor Trudeau. Tri-Valley — Ashland: Andrew Abraham. Dover-Sherborn: Brandon Jaeger. Holliston: Tyler Perry, Max Turcotte. Medfield: Ben Cox, Matt Crowell, Matt Dresens, Tyler Etzkorn, Johnny Monahan, Rob Treibor. Medway: Nick DeCristoforo, Andrew Karlin, Kevin Kaufman, Jack Kilty, Mike Narducci, Josh O’Toole, Max Turcotte. Westwood: Diarmuid Gallagher, Joe Reissfelder, Will Ribas.